Oh yes, they did! In a widely-anticipated announcement, the Bank of England (BOE) finally fired its first bullets since the EU referendum. Missed the event? Here’s a little Q&A session for central bank junkies out there. What’s so special about THIS announcement? Back in late June the U.K. voted to leave the European Union (EU), something that the BOE was dead set against. See, they worried that an unprecedented vote to leave would divert the economy from its path to recovery, as uncertainty weighs on business and consumer sentiment. Fast forward to July after Brexit votes won anyway. The BOE refrained from making any policy changes, citing lack of post-Brexit data to work with. This time around the members had enough numbers to make its forecasts and… they didn’t like what they saw. Yesterday the BOE delivered a rate cut, new funding programs, revived an asset-purchasing program, and provided forward guidance. What exactly did the BOE do? 1. Cut interest rates from 0.50% to 0.25% – Yesterday’s rate cut not only marked the first since 2009, but it also put the U.K.’s rates at its new RECORD LOW. Talk about making history! 2. Launched the Term Funding Scheme (TFS) – Since the BOE’s rates are already close to zero to begin with, regular banks would have a difficult time cutting their own deposit rates, which would then limit their capacity to cut their lending rates. This reduces the effectiveness of a rate cut. The TFS, potentially worth up to £100B, would provide loans to institutions at rates close to the bank rate to help pass on the rate cut to households and businesses. 3. Restarted the asset-purchasing programme –The program, paused in 2012, will now be worth a total of £435B. BOE head honcho Mark Carney and his gang would purchase £60B worth of U.K. government bonds over the next six months to keep a lid on yields on securities that are used to determine interest rates for households and businesses. Of course, it also won’t hurt if bond-holders would shift their investments to riskier assets. 4. Purchase corporate bonds – The BOE plans to buy £10B worth of corporate debt over the next 18 months starting in September. They aim to reduce liquidity problems in the secondary market and entice risk-takers to invest in more high-yielding assets. Carney said that bonds issued by around 150 companies could be eligible for purchase. Why is the BOE doing all these? The BOE doesn’t believe in pussyfooting, that’s why. With the data that they have, Monetary Policy Committee (MPC) members have predicted that the pound’s decline would push inflation higher in the near term but that spare capacity would result to higher unemployment and even subdued growth in H2 2016. Is the BOE planning to add more stimulus? Oh yeah. They’ve only just begun. In the last part of its statement, the BOE warned that the “package” has scope for further action. More specifically, the members can still lower its rates further, expand the TFS, and step up its government and corporate bond purchases. Heck, if the next reports turn out to be consistent with the bank’s August Inflation Report, then we’ll likely see at least one more rate cut from the BOE. Duhn duhn duhn. 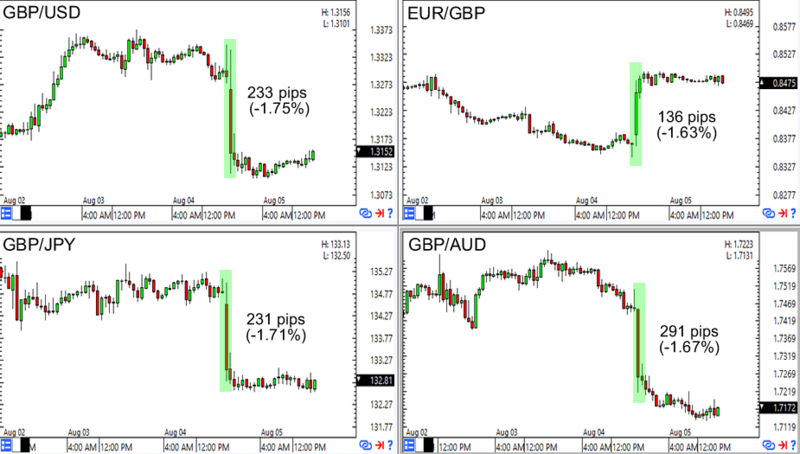 How did the pound react? Not surprisingly, the pound fell sharply at the BOE’s bazooka. What’s more, it barely got a breather and STAYED DOWN for the rest of the U.S. and Asian trading sessions. Do you think the BOE will cut its rates further next month?